Nutri care is our home brand and the object of our pride. 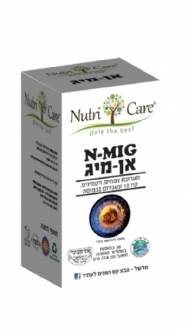 The first product of Nutri care have been placed of the shelf on 1996. As years went by, a lot of products have been added to this trademark, in about 15 different and varied categories. 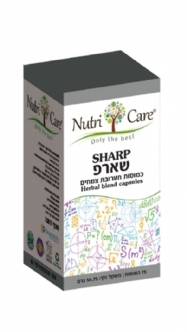 Some of Nutri care's products are imported from around the world (mostly from USA) and some of them are produced in Israel. All of the products are produced under the most strict quality administration and production standards of GMP (Good manufacturing Practice) and ISO (International Standards Organization). 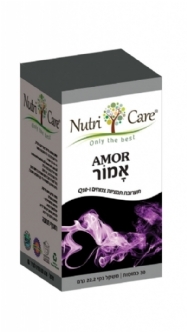 Nutri care's products, about 130 products, are based on science and their activity is supported by articles and researches. A big part of them is unique and creative, with no competitors in the market. The nutritional supplements branch, including Nutri care, was recently found under the widely open eye of the "Big Brother". The regulation in the state of Israel has increased its activity and has placed her hand on the entire branch. We are all required now to be strict for minor or serious, mostly on the same prohibition, that says: "No man will ever attribute in any kind of advertising way, a healing feature of a nutritional necessity, whether if it contains vitamins or minerals and whether it does not contain vitamins or minerals, he shall not advertise that its consumption by a person, might heal or prevent any kind of disease". Therefore, the website contains only technical information about each product and product and lots of general and professional information, which you can be helped with and find a great benefit in it. All of Marshal's products, all of the different trademarks, are not medications but supplements approved by the ministry of health for importing or for manufacturing. For proper disclosure it is clarified, that the given confirmation is only for the safety of the usage of a product's components, and it is not a certificate of approval or a written proof, for the purposes of a product's usage, or any medical indication, in case there is one. Everything that is being said in our website was not checked and was not certified by the health ministry. Marshal company wishes to unequivocally emphasize, that the information presented in this website does not have any medical indication or a recommendation for treatment and with any medical problem that arises, it is needed to consult a doctor. A decision of purchasing a product, as well as a decision of using a product and/or concluding any kinds of conclusions, about the purpose of the usage of a product, is only on the responsibility of the consumer. In any case, it is recommended to consult or use reliable and credible information sources and qualified professionals.